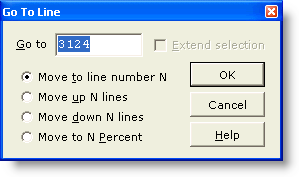 The Go to Line command can be used to jump immediately to a specified line number in the current file. Options are also provided in the Go to Line dialog box to move up or down by the value specified, or to treat the value as a percentage. For example, specifying 50% would result in movement to a line midway through the file. If text is selected when this command is issued, an option will be available to extend the selection to the new location. The current line number is always displayed on the Status Bar, next to the 'L' label. The Go to Line command can also be issued by double clicking within the line number display in the Status Bar. The Go To Line number dialog also recognizes the following syntax: +10 to jump ahead 10 lines; -15 to jump back 15 lines, and 45% to move to the 45 percent position in the file. The use of this syntax overrides the mode indicated by the radiobutton options.